Domestic and Industrial Electrical Services, London and the South East. Flickering lights or a smell of burning plastic? Overheating cables or crackling electrical connections? Machinery off-line because of a constantly tripping supply? Or do you need a qualified electrician to check and upgrade your installation? 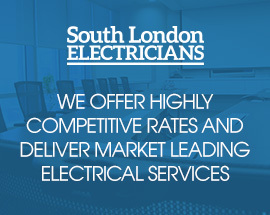 Whatever your electrical needs in London, South London Electricians are on hand to help. No project is too small or too big. We undertake all domestic, commercial and industrial electrical work and offer a 24/7 emergency electrician service. You will speak to a trained electrician as your first point of contact so we can try to give you the relevant information you need to keep yourself safe until our electrician arrives. We guarantee that we will always strive to do everything we can to help you out, whether this is over the phone or in person. For Landlords of properties and HMO’s in south London, we can offer everything from safety testing to re-wiring. Our commercial electricians are available for all industrial or commercial maintenance for businesses such as restaurants, hotels, gyms, warehouses, factories and retail establishments. We offer a full range of certified repairs, upgrades and new installations including single phase and high current three-phase work. All of our work is carried out to the highest standards and using the best quality materials. We are members of Trustmark, the Electrical Safety Register, the Electric Competent Person Scheme and NICEIC. So why delay, to benefit from competitive rates and an efficient customer-centred service, call South London Electricians on 0208 406 9834 for a no-obligation chat about how your South London home or business could benefit from our domestic, industrial and commercial electrical services.